resolute philsophy that has led to a remarkable record . It is summed up best in his own words. Published in Sports Illustrated Magazine, December 8, 1958 , pp. 100-106. I N BASKETBALL, as in all phases of human endeavor, there are certain laws that govern and regulate the pattern that measures success and failure . In the business world there have been many men of outstanding talents who have molded large corporations into world leadership . This is true in religion, in education and also in sports . The philosophy that has governed the lives of the boys here at the University of Kentucky in the past 28 years may not have been different from that which has been employed elsewhere, but its application may have been better. Unfortunately, today in the sports world too many coaches are constantly worrying about what the other coach is doing rather than spending their time in a constructive way developing talent that is at their disposal . We here at the university believe that every coach should have a definite plan and that every practice session should have an aim and a purpose . It is my opinion that if you have a well-organized practice, conducted along the same lines as those employed by a successful professor in chemistry, law or medicine, and if the boys see that there is a reason for them to repeat hundreds of times the fundamental details that are essential in developing a good basketball player, the work will not only be done well, but will also be done with enthusiasm. hope your hope and pray your prayer. I am sure that if a coach will follow this philosophy of life, he will be successful . To sit by and worry about criticism, which too often comes from the misinformed or from those incapable of passing judgment on an individual or a problem, is a waste of time. Adolph Frederick Rupp, 56, this week started his 29th season as basketball coach at the University of Kentucky . Born in Halstead , Kansas in 1901, Rupp was graduated in 1923 from the University of Kansas , where he played guard on the basketball team under the famous Phog Allen . 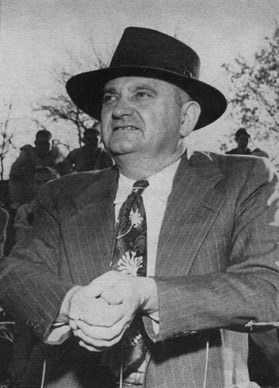 Before Rupp arrived in Kentucky in 1930 the school had passed through 15 coaches in 26 seasons, while compiling a middling record of 199 wins, 133 losses and one tie . During Rupp's first four years Kentucky won 65 games, lost but nine . His overall record shows 584 victories and 103 defeats for a winning percentage of .850, better than any coach active in major college basketball . Kentucky, under Rupp, has won an unprecedented four NCAA Championships, 18% Southeastern Conference titles (they tied with LSU in 1935), one NIT Championship. The only serious setback Rupp has suffered came in 1952 when the NCAA banned Kentucky for the 1952-53 season for "subsidization eligibility infractions. " Rupp weathered that storm and came back stronger than ever . Today he is a five-time president of the Kentucky Hereford Association, is a director of the Central District Warehousing Corporation (burley tobacco) and in 1950 was chosen one of the 10 outstanding Shriners in America . He lives with his wife Esther and his 18-year-old son Adolph Jr. in Lexington . He has said, "I've gotten a lot of publicity for being a mean man . But it's not true . The fact is I've got an invitation to coach both basketball teams when I go through the pearly gates." There are certain things that we believe are necessary in order to develop a great team . We here at the University of Kentucky are fortunate . We have a great basketball tradition . Almost every boy in this area lives for the day when he can come to the University of Kentucky and represent it on the hardwood . We have been doubly fortunate in that 87% of the boys who have lettered here in basketball in the past 28 years have been native sons of Kentucky . We want boys who have determined that they would like to come to our university . We feel that every boy who puts on a Kentucky uniform just plays a little better than he would in one of another color . A school rich in tradition is fortunate indeed. We also believe that the intangible quality called "spirit" is essential . Spirit is that quality which enables a player to do better than he is physically capable of doing. Now, how is this spirit developed ? As I have said before, tradition is important . It carries on from year to year . Boys will emulate and copy the style of play that has been used by those who have gone before . Our boys, during the course of the year, will look for hours at moving pictures of our great athletes in order to copy and learn the best method of executing our fundamental details . It is not necessary for us to do a big selling job to our boys . Spirit is contagious and, if we can create within the boys a genuine desire to give the best they have at all times, then I am sure the best will come back to us. We do not wish merely to participate in sports . We wish to be successfid in sports ! In order to be successful we must create within these boys the competitive spirit that will bring success . Defeat and failure to me are enemies . Without victory, basketball has little meaning . I would not give one iota to make the trip from the cradle to the grave unless I could live in a competitive world, and by competitive world I mean a democratic world where every boy has an opportunity to become the greatest in his chosen profession . When a boy lines up in the 100-meter dash in the Olympic Games and finds a Russian, an Englishman, a Frenchman and a German in the starting lanes next to him, when the gun is fired there is not a single subsidy in Washington which is going to bring him in first . When a man stands at the home plate with the bases loaded and two out, and the pitcher winds up to throw, there isn't anything that anyone can do to help the pitcher or the batter . It is a competitive world, it is free enterprise and it should be encouraged. I like to think of the philosophy of Etienne Gilson, one of the world's great philosophers . He says, "True democracy in education certainly consists in insuring the intellectual survival of even the unfit; it cannot possibly consist in preventing the natural superiority of the fittest from bearing their fruits to the greater benefit of all. "This obvious truth should not be so hard to understand . There is nothing less democratic, in the usual sense of the word, than sports and games . Championship is the triumph of carefully cultivated natural inequalities . There is no point in pretending that, in a democracy, every citizen should be able to beat Olympic records . We simply cannot do it, however hard we try, but we do not resent the fact . We do not ask our directors of athletics to prevent some students from running as fast as they can, because if they did, they would run faster than others . We do not consider it democratic to set athletic standards as low as possible . On the contrary we fully realize that the exceptional performances of a few world champions act as a fruitful challenge whose effects are actually felt in stadiums and on all athletic fields . In short, the only sound policy for any democracy is to raise the average level of its people by cultivating the excellency of the best among its citizens." Again let me repeat, it is the exceptional performances of the few which act as a challenge to all . In sports, the challenge is open to all . Every boy in this country can break an Olympic record if he so desires, if he has the ability and if he applies himself. If a young man is to become successful in anything, he must have loyalty . In basketball he must, first of all, be loyal to himself, his teammates, his coach and his school . Loyalty means playing up to his capabilities . At times a boy is defeated on the basketball floor . Defeats, intelligently used, are steppingstones to success . We tell our boys, when they are defeated, we want them to be broad-minded and hold their heads high, accept defeat graciously, but learn a lesson from the defeat that will pave the way to victory . These are the qualities we want in our boys . Maybe it would be well to make a routine check of the methods that we employ here at the university . The boys, who have been entrusted to my care, the same as those who have been entrusted to all the professors on the campus, have not been sent here by their parents to fail . They have been sent here to become successful . Therefore, I am of the opinion that my classes in basketball should be taught the same as any other class on the campus. I was greatly amused at a sportswriter who visited us here this past winter . He came out to watch our practice . My boys shot their free throws, took their warm-up practice shots and then went to our fundamental drills and to our organized play . When the practice was over, the sportswriter said, "Don't these boys ever talk ? " I said, "Yes, they talk occasionally, but it is generally understood out there that no one is to speak unless he can improve on the silence ! " He said, "Don't your boys ever have any fun ? " I said, "Yes, they have as much fun, or more, than any other players . Why should boys constantly chatter in a class in basketball any more than they do in a class in English ? Why should they whistle and sing ? I don't believe that you can get the maximum efficiency from a boy and have his undivided attention whenever you have a lot of noise at a practice session." These words came home to haunt this sportswriter, for, as I am told, he sat in the press row at the NCAA finals and watched this same group of boys who had been well disciplined win the NCAA Championship and derive more fun out of winning than any group in America . While those boys who employed "horseplay" in practice sat home and listened to our boys play, our players walked off with all honors and had the mark of excellence stamped on their record. How did they accomplish this ? They achieved their success with an intense desire to win, to win fairly and by the rules . We feel that when we have taught a boy this lesson we have taught him the finest philosophy of life. We hear coaches say, "We aren't winning this year, we're building character ! " I have always disagreed with that . The finest character is built when you have a winning team and when you teach the boys to be successful in all their undertakings . We believe that success in sports has a carryover value in the life that is ahead of these boys . We told our boys last year, as we came down the homestretch and everyone prophesied that we would not win, that if we would all get together and work as a unit, pay careful attention to fundamental details, that, possibly, we could become the Cinderella team of all time. Up to that time the praises that were passed out to our boys were not great . Our boys were considered average in ability by everyone . However, you cannot measure the desire in a boy, you cannot measure the heart in a boy . I told them that if we would all work together as a unit, we could win . I told them, "Boys, it is just this simple; individually we will not go anywhere, as a unit, we can . The time has come when either you have to fish or cut bait," and those who could not fish were certainly cutting bait on the bench by shouting encouragement to the boys who were playing. There is only one way to face a difficult task and that is to make preparations to solve it . Championships are not won by wishing and hoping; they are won by hard work and willingness on the part of the boys to sacrifice some of the normal phases of college life . As I tell my boys, "If you are in the habit of smoking, I would like for you to stop . Let your opponents smoke ! Let's make it a rule to be in bed by 10:30 or, if you are not in bed, let's be in our rooms and off the streets . Some of you are required to study late . That is perfectly all right . You will be remembered long in this world for what you learned here in the University, rather than for that which you do on the basketball floor!" The conditioning of a group of boys is important . We here at the university do not use a training table except during our regular season . We do not like to supervise the boys too much . They come from good families . They know what is right and what is wrong . It is our plan to get them into good physical condition because no team can win unless it is in excellent condition . Since the basketball season lasts about five months, conditioning can be important . It is just as important not to work too hard as it is to work hard enough . That is why I say a practice session should be intelligently organized . We ask our trainers to keep careful check on the physical condition of every boy . A boy should not lose weight during a season . If he does, a physician should immediately be consulted . On our trips we try to relax as much as possible . Most of the boys take books with them . We usually like to practice at home on Friday night, then have our dinner at Lexington and catch a plane at 7 o'clock, say, to Knoxville . By the time the boys get to the hotel and check in, it is bedtime . We get up in the morning at 7:45 and have breakfast together . We give the boys freedom until about 10 o'clock , then we go out to the gym and shoot baskets for about 30 minutes . This serves a twofold purpose: it breaks the monotony and it accustoms us to the place where we will play that night . We eat at 12 o'clock , have a short chalk talk to go over our last minute notes, then the boys retire to their rooms from 2 to 5, where they can either study or rest, whichever they prefer . The main thing is that they are relaxing and are off their feet. After the game we fly back to Lexington , eat on the plane, and usually are home in bed by midnight . We lose very little time from school on these trips . We make the sophomores handle the luggage . We call them the "dead heads. " Everyone making the first trip, even if he is a newspaper sportswriter, must get on the baggage detail . The sophomores stay on the detail for the year . It helps build morale and gives the older players a lift. These are a few conclusions that I have reached in sports . We had a sportswriter several years ago make the statement that "When the Great Scorer comes to mark against your name, He writes not that you won or lost, but how you played the game. " I do not believe that the author of these words ever meant them to apply to basketball, football or baseball . If he did, why do they keep score in these contests ? Do you imagine that 100,000 people come out on a Saturday, pay $4 and sit in a rainstorm to watch a football game and have no interest in whether the teams win or lose ? It is hard for me to think that the thousands of spectators who come to see the university play basketball, drive over 100 miles on the evening of a game, and then go home that night are not interested in the outcome . I don't believe that General Motors operates on the idea that it does not make any difference whether they make any money or not, just so they have a lot of fun ! I don't believe that a doctor, when he goes in to perform a difficult operation, tacks up a sign, "It doesn't matter whether you live or die, it's how I make the cut! " And I don't plan to chaperone a bunch of boys around for an entire winter and not teach them to be successful in their undertakings. Rupp with K.U. (sic) Olympians . 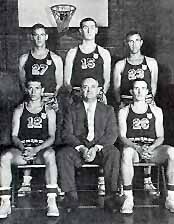 Wah Wah Jones (27), Alex Groza (15), Cliff Barker (23), Ralph Beard ( 12) and Ken Rollins. Success and bigness do not mean badness ! Success does not mean that virtues have been eliminated . I think success bolsters the individual morale and the morale of the entire student body and I do not believe anything has happened in the Commonwealth of Kentucky which has given so much genuine joy and satisfaction as the university team winning the NCAA Tournament last year . Success is the cement that holds people or organizations together. Some college professors complain about the fact that students exhibit more taste for athletics than for intellectual studies . I must admit I find that true to a large extent . But athletics are animated by a liberal spirit and, as Mr. Gilson has said, instead of asking for less athletics, we should rather bring back to the classroom the liberal spirit which once inspired it and still inspires athletics . Where the liberal spirit still prevails, students still derive as much pleasure from the classroom as from the athletic field. I believe that a boy in basketball should be given to understand the definite purpose and aim that the coach wishes to emphasize . Basketball must have a pattern . You can not allow boys to deviate too much from that general scheme, but the individual habits and techniques that our boys have should be encouraged. Unfortunately, the teachings which we have in the classroom have come from a few great creative minds and they have been passed on from generation to generation until they have become dull . There are few truly great creative thinkers . In basketball a boy will sometimes, on his own, come up with the greatest plays that will bring thousands of spectators out of their seats . I wish the same could be said for all phases of the classroom procedure. I have made this suggestion on many occasions and I would like to make it once more . A reward for accomplishment and for excellence should be given in athletics, and I hope the day will come when the same recognition will be given for achievement and excellence in classroom performance. That will serve as an inspiration to revive again the liberal spirit that once permeated our great institutions of learning.